i scream for sunshine: wander. this poster is from striking truths. in high school, my art teacher had a poster up that said "all who wander are not lost". for four years i stared at that poster. i pondered it, and came to the conclusion that maybe this was my life's motto. or at least should be. because when you're in high school, you do wander. a lot. that's the point, right? you don't know what you want to do with your life, so you should be doing a little bit of everything. meandering through life, exploring, trying new things, and figuring out what's what. why does that idea have to change when we become adults? when you go to college, wandering through life is still encouraged -- take a lot of different kinds of classes, see what you like, then decide if you really want to become a doctor or a lawyer. maybe you want to be an anthropologist, and you never knew it before. but then you leave college and you're supposed to have it all figured out. why? why can't i continue to try new things? or change my mind on where i want to live or what i want to do? why must our lives be so static just because we are in our mid-20s, 30s, etc.? i don't like it. i've made a lot of changes in the past two years of my life, and sometimes people look at me like i'm crazy. "how could you move out of new york?" "why mexico? "weren't you nervous?" "arizona?!" but these are good changes. throughout these changes, and these meanderings, i've had to grow and learn a lot about myself. and sure, these wanderings have been scary, and sometimes i've felt lost, but i think i've really benefited from them. so i agree, not all who wander are lost. in fact, maybe they are growing and learning. 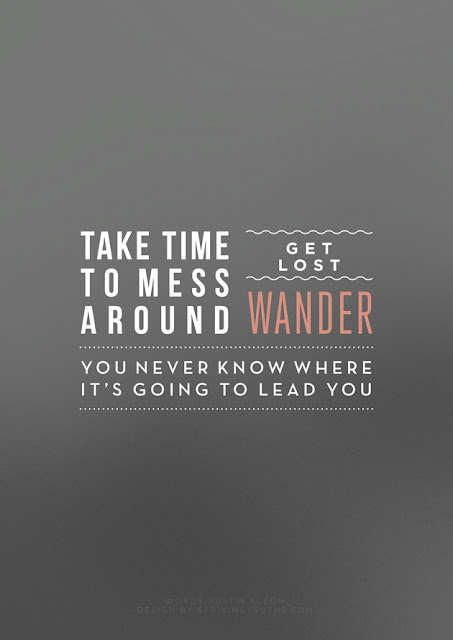 and maybe we should all do a little more wandering. so i'm trying something new, i'm trying to wander more. i'm stopping to buy citrus on the side of the road. i'm leaving a little earlier so that i can take pictures of cotton or cows. i'm trying to learn new things, like knitting. because wandering is good; you never know what you may find and the joys it may bring. what would you like to do if you had the time to wander?